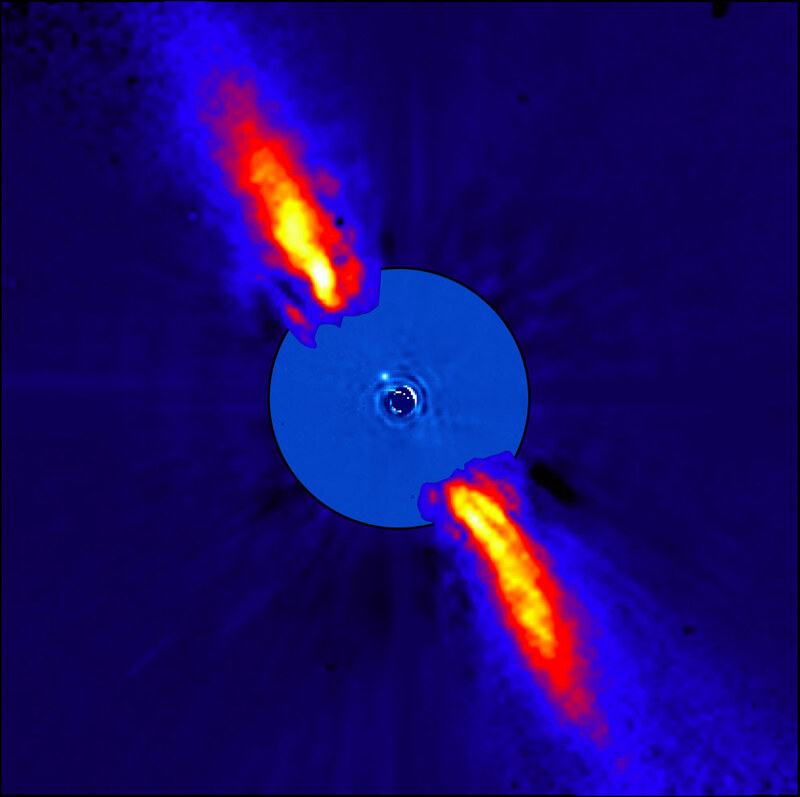 This composite image represents the close environment of Beta Pictoris as seen in near infrared light. This very faint environment is revealed after a very careful subtraction of the much brighter stellar halo. The outer part of the image shows the reflected light on the dust disc, as observed in 1996 with the ADONIS instrument on ESO’s 3.6 m telescope; the inner part is the innermost part of the system, as seen at 3.6 microns with NACO on the Very Large Telescope. The newly detected source is more than 1000 times fainter than Beta Pictoris, aligned with the disc, at a projected distance of 8 times the Earth-Sun distance. This corresponds to 0.44 arcsecond on the sky, or the angle sustained by a one Euro coin seen at a distance of about 10 kilometers. Because the planet is still very young, it is still very hot, with a temperature around 1200 degrees Celsius. Both parts of the image were obtained on ESO telescopes equipped with adaptive optics. Credit: ESO/A.-M. Lagrange et al. Astronomers make the most complete census of comets around another star, revealing that individual comets orbiting the star Beta Pictoris belong to two distinct families of exocomets. The HARPS instrument at ESO’s La Silla Observatory in Chile has been used to make the most complete census of comets around another star ever created. A French team of astronomers has studied nearly 500 individual comets orbiting the star Beta Pictoris and has discovered that they belong to two distinct families of exocomets: old exocomets that have made multiple passages near the star, and younger exocomets that probably came from the recent breakup of one or more larger objects. The new results appear in the journal Nature. For almost 30 years astronomers have seen subtle changes in the light from Beta Pictoris that were thought to be caused by the passage of comets in front of the star itself. Comets are small bodies of a few kilometers in size, but they are rich in ices, which evaporate when they approach their star, producing gigantic tails of gas and dust that can absorb some of the light passing through them. The dim light from the exocomets is swamped by the light of the brilliant star so they cannot be imaged directly from Earth. A giant planet, Beta Pictoris b, has also been discovered in orbit at about a billion kilometers from the star and studied using high resolution images obtained with adaptive optics. Moreover, the orbits of these comets (eccentricity and orientation) are exactly as predicted for comets trapped in orbital resonance with a massive planet. The properties of the comets of the first family show that this planet in resonance must be at about 700 million kilometers from the star — close to where the planet Beta Pictoris b was discovered. Image: ESO/A.-M. Lagrange et al. Be the first to comment on "Astronomers Discover Two Distinct Families of Exocomets Around Beta Pictoris"